Add your favourite beans to a spicy tomato sauce with chunks of courgette, mushrooms, etc. 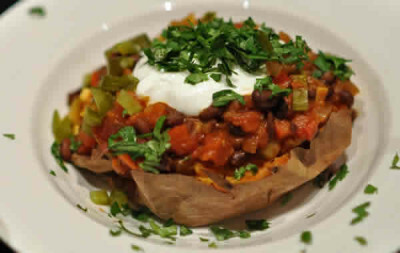 Serve with a baked sweet potato for the perfect accompaniment. 2. Place sweet potatoes on a baking tray in the oven. Bake for at least one hour, until tender. 3. Heat oil in a pot. 4. Add red and green bell peppers, mushrooms and onion and cook until softened. 5. Add garlic and cook about a minute, then add chili powder, cumin, tomatoes and beans. 6. Reduce heat, cover and simmer about 20 minutes. 7. Add zucchini and continue cooking until tender, about 10 minutes. 8 Split the sweet potato and fluff the flesh a little with a fork. Pile some of the chilli on top and garnish with some chopped cilantro (coriander) if desired.